The Importance of Planning this Holiday Season - The Hart Law Firm, P.A. Thanksgiving is one of my absolute favorite holidays. Between spending time with my family and friends, eating some good food, enjoying a nice glass of wine and maybe even watching some football, it really doesn’t get any better for me. 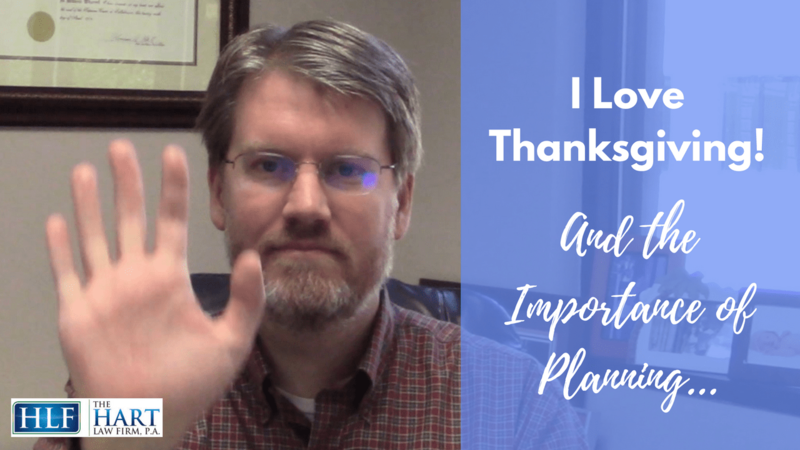 Here is a quick video I did today to talk more about why I love Thanksgiving, and why the planning that we do to prepare for this holiday makes it flow so smoothly. For those of you that would rather read, here is the full transcript! You Plan for the Holidays… Why Not Plan for Life? What Would Thanksgiving Look Like if You FAIL to Plan? Hey everyone. Jim Hart here, and today I want to talk about this wonderful holiday we have tomorrow called Thanksgiving. Thanksgiving is one of my favorite holidays. It’s a great time to get together with family and friends and loved ones, and spend time together, and maybe enjoy a few beverages if that’s what you like to do… But you also get to see the kids, see the cousins, and see everyone else that you haven’t seen since probably, if you live far away, maybe it’s been Labor Day, maybe it’s been from last summer that you’ve seen these people. Thanksgiving is a time to give thanks and to be grateful for what we have, and be grateful that we live in this wonderful country, and be grateful for the fact that we can sit down and have this meal together with one another. It’s really just a wonderful time to bond together, as a family unit, and if you’re not with family, maybe you’re with friends, and everyone has their own different shapes and sizes to what they do for this holiday. But in the United States, it’s really a wonderful time. Like I said, it’s been one of my favorite holidays since I was a kid. One of the reasons we can enjoy this holiday so well is that we’ve prepared for it. We’ve taken the time off work, we’ve taken our kids out of school, we’ve been to the store, we’ve bought the groceries, we get up early to start cooking. In the case of my family, we go to Café Parizade in Durham, where we’re able to eat with family and friends there because we thought ahead to buy the tickets to that event many weeks ago. We’ve thought about all these things before the day actually comes. So whether it’s how we’re going to get to the gathering, to what kind of wine we’re going to drink with dinner, to what type of whipped cream we’re going to put on the pie, we’ve planned ahead to make this a great day. We’ve done all these things, we’ve prepared for every last detail of this wonderful holiday event. I guess that’s really the message I have for you today, is that sometimes it takes a little planning to make these things go smoothly, and estate planning is really no different. So, it’s really important to plan ahead for what could happen if something happens to you or a loved one, or a child or something. That’s what estate planning is all about. It’s about making all these plans in advance so that when something does happen, you can enjoy these moments in life like Thanksgiving, and other holidays, and time with family, and not worry about what’s going to happen. There are countless issues and circumstances that can come up if you fail to plan, and some of them are, just to name a few, people who are entering end of life situations, who maybe don’t have that much longer to live, or maybe they’re going to be going into a nursing home in the next few years. It’s important to do some proactive planning to protect assets and make sure everything happens smoothly so that your family is not left holding the burden of what’s going to happen to you when something like that happens. If you fail to plan, basically if you get in a situation where number one, you could lose all your assets very easily, everything that you’ve worked so hard over a lifetime to build could be gone. And that’s not necessarily saying that you wanted to leave something to children, or to your heirs, or things like that. Maybe you’re very charitable, you want to leave things to a charity. Everything you worked so hard for will be gone. In addition, you may need money for yourself. There may be things that your health insurance will not pay for when you get to that situation, and if you don’t plan appropriately, you’re not going to have anything left to provide for those necessities, those medical necessities that come up. 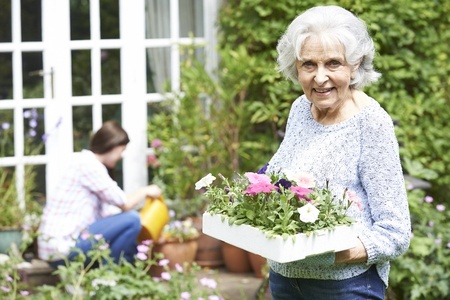 Perhaps you need a caregiver to come to the home to help you. Well, that costs money and if you don’t have a family member that’s available for that, you need to plan for ways that you can pay for that. Perhaps you get to a point where you can no longer make decisions on your own. Have you planned in advance who is going to make your healthcare decisions for you? Who is going to make your end of life decisions for you? Who’s going to make your financial decisions for you? Who do you trust to do that? If you don’t plan, you’re not going to have that person in place to handle those decisions when the time comes. If you haven’t prepared a proper power of attorney, if you haven’t decided who is going to be able to make all these decisions and do other estate planning on your behalf, then it’s possible that your family members may need to go through a lengthy and costly court process called “Guardianship,” to make sure that you are taken care of and that somebody is in place to handle these affairs. I think the last thing to think about, when you fail to plan, is that if we talk about tomorrow being Thanksgiving, and wrapping this all up, you imagine you’re going to have a fairly smooth, wonderful day with all your family members, everyone potentially getting along, hopefully, and everything going smoothly. If you fail to plan, it can cause discord between family members. It can cause infighting among family members, over what your intentions may or may not have been. One of the most important things that you can do when you put this plan in place, is you really are setting up your family to have a smooth transition to these end of life issues. That’s kind of the most important thing I can leave you with today. I understand, planning ahead is not easy, but it’s important. It’s something you need to do. If you have any questions, we’ve got some seminars coming up to talk about these issues. We’d be more than happy to see you at one of those. This is Jim Hart, I hope you have a wonderful Thanksgiving. Thank you so much, and have a great holiday weekend, folks. Take care. Previous Post: « Getting Excited about Tomorrow’s Seminar!